USES: This medication is used to treat swelling (inflammation) of the eye after cataract surgery. It is also used after another type of eye surgery (corneal refractive surgery) to temporarily relieve pain and sensitivity of the eye to light. 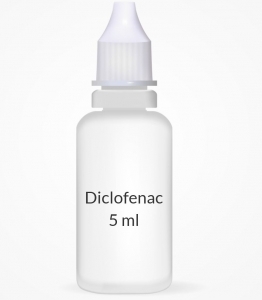 Diclofenac belongs to a class of drugs known as nonsteroidal anti-inflammatory drugs (NSAIDs). OTHER USES: This section contains uses of this drug that are not listed in the approved professional labeling for the drug but that may be prescribed by your health care professional. Use this drug for a condition that is listed in this section only if it has been so prescribed by your health care professional. This drug may also be used to treat swelling from other eye conditions due to inflammation or injury. HOW TO USE: Apply this medication to the affected eye as directed by your doctor. The dosage and duration of treatment is based on your medical condition and response to treatment. Do not wear contact lenses while you are using this medicine unless your doctor approves of it. Sterilize contact lenses according to the manufacturer's directions, and check with your doctor before you begin using them again. To apply eye drops, wash your hands first. To avoid contamination, do not touch the dropper tip or let it touch your eye or any other surface. Tilt your head back, look upward, and pull down the lower eyelid to make a pouch. Hold the dropper directly over your eye and place 1 drop into the pouch. Look downward and gently close your eyes for 1 to 2 minutes. Place one finger at the corner of your eye (near the nose) and apply gentle pressure. This will prevent the medication from draining out. Try not to blink and do not rub your eye. Repeat these steps if your dose is for more than 1 drop. Do not rinse the dropper. Replace the dropper cap after each use. If you are using the single dose units, discard the unit and any remaining solution after one use. If you are using another kind of eye medication (for example, other drops or ointments), wait at least 5 to 10 minutes before applying other medications. Use eye drops before eye ointments to allow the drops to enter the eye. This medication is intended for short-term use only. Do not use this medication more often or for longer than prescribed because doing so may increase your risk of serious side effects. Do not use this product if it becomes contaminated (for example, drops turn cloudy or a dark color). Use of contaminated eye medication can cause infection, serious damage to the eye, and loss of vision. Contact your doctor or pharmacist for more information. Tell your doctor if your symptoms persist or if they worsen. SIDE EFFECTS: Stinging/burning of the eyes for 1 to 2 minutes and temporary blurred vision may occur when you apply this medication. Watery eyes may also occur. If any of these effects persist or worsen, tell your doctor or pharmacist promptly. Remember that your doctor has prescribed this medication because he or she has judged that the benefit to you is greater than the risk of side effects. Many people using this medication do not have serious side effects. Tell your doctor immediately if any of these rare but serious side effects occur: eye pain, decreased vision, bleeding in the eye (increased redness in the eye). A very serious allergic reaction to this drug is rare. However, seek immediate medical attention if you notice any symptoms of a serious allergic reaction, including: rash, itching/swelling (especially of the face/tongue/throat), severe dizziness, trouble breathing. This is not a complete list of possible side effects. If you notice other effects not listed above, contact your doctor or pharmacist. In the US - Call your doctor for medical advice about side effects. You may report side effects to FDA at 1-800-FDA-1088. In Canada - Call your doctor for medical advice about side effects. You may report side effects to Health Canada at 1-866-234-2345. PRECAUTIONS: Before using diclofenac, tell your doctor or pharmacist if you are allergic to it; or to aspirin or other NSAIDs (such as ibuprofen, celecoxib); or if you have any other allergies. This product may contain inactive ingredients (such as polyoxyethylated castor oil found in some brands), which can cause allergic reactions or other problems. Talk to your pharmacist for more details. Before using this medication, tell your doctor or pharmacist your medical history, especially of: aspirin-sensitive asthma (a history of worsening breathing with runny/stuffy nose after taking aspirin or other NSAIDs), other types of asthma, growths in the nose (nasal polyps), bleeding or clotting problems, other eye problems (such as cornea problems, dry eye syndrome, past eye surgeries), diabetes, rheumatoid arthritis. Your vision may be temporarily blurred after applying this medication. Do not drive, use machinery, or do any activity that requires clear vision until you are sure you can perform such activities safely. Before having surgery, tell your doctor or dentist about all the products you use (including prescription drugs, nonprescription drugs, and herbal products). Before using this medication, women of childbearing age should talk with their doctor(s) about the benefits and risks (such as miscarriage). Tell your doctor if you are pregnant or if you plan to become pregnant. During pregnancy, this medication should be used only when clearly needed. It is not recommended for use during the first and last trimesters of pregnancy due to possible harm to the unborn baby and interference with normal labor/delivery. It is not known whether this drug passes into breast milk. Consult your doctor before breast-feeding. DRUG INTERACTIONS: The effects of some drugs can change if you take other drugs or herbal products at the same time. This can increase your risk for serious side effects or may cause your medications not to work correctly. These drug interactions are possible, but do not always occur. Your doctor or pharmacist can often prevent or manage interactions by changing how you use your medications or by close monitoring. To help your doctor and pharmacist give you the best care, be sure to tell your doctor and pharmacist about all the products you use (including prescription drugs, nonprescription drugs, and herbal products) before starting treatment with this product. While using this product, do not start, stop, or change the dosage of any other medicines you are using without your doctor's approval. Some products that may interact with this drug include: corticosteroids (such as prednisone). This medication may increase the risk of bleeding when used with other drugs that also may cause bleeding. Examples include anti-platelet drugs such as clopidogrel, "blood thinners" such as dabigatran/enoxaparin/warfarin, among others. Check all prescription and nonprescription medicine labels carefully since many medications contain pain relievers/fever reducers (aspirin, NSAIDs such as ibuprofen or naproxen). These drugs are similar to diclofenac and may increase your risk of side effects if taken together. However, if your doctor has directed you to take low-dose aspirin to prevent heart attack or stroke (usually at dosages of 81-325 milligrams a day), you should continue taking the aspirin unless your doctor instructs you otherwise. Ask your doctor or pharmacist for more details. This document does not contain all possible drug interactions. Keep a list of all the products you use. Share this list with your doctor and pharmacist to lessen your risk for serious medication problems. NOTES: Do not share this medication with others. This medication has been prescribed for your current condition only. Do not use it later for another eye condition unless told to do so by your doctor. A different medication may be necessary in that case. STORAGE: Store at room temperature according to the product package instructions for your brand, or ask your pharmacist. Do not store in the bathroom. Keep the bottle tightly closed when not in use. Keep all medicines away from children and pets. Do not flush medications down the toilet or pour them into a drain unless instructed to do so. Properly discard this product when it is expired or no longer needed. Consult your pharmacist or local waste disposal company for more details about how to safely discard your product.